A project between the Cohen Home and Bet Haverim is culminating in a video, a photo exhibit and a gala. Selma Burke (left) welcomes Alia Adler to her beloved wall of artwork at the Cohen Home. 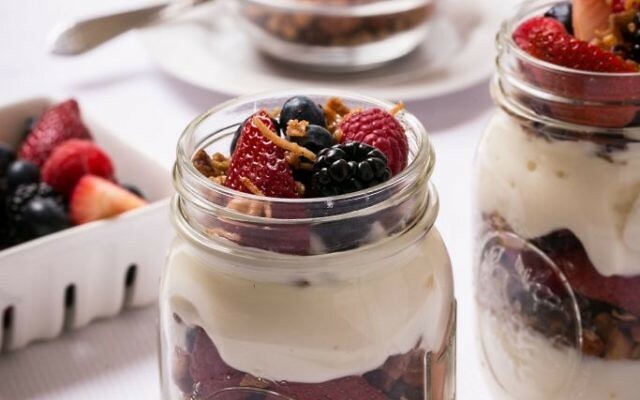 A peek inside the Cohen Home on any given Sunday reveals residents benefiting from life-enrichment activities, high-quality care, delicious meals, and caring volunteers and visitors. But recent Sundays have brought a new level of excitement to the assisted living community in Johns Creek. 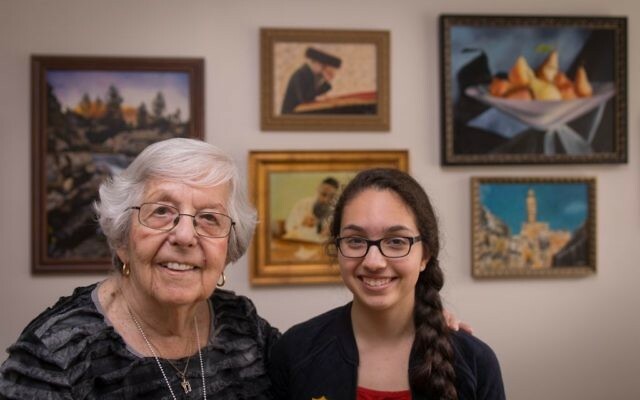 Cohen Home residents have enjoyed visits with teenagers from Toco Hills’ Congregation Bet Haverim, who arrive with video cameras, smiles and questions for their older friends. Estelle Showe shares a photo with Jordan Walter. Under the guidance of Bet Haverim’s education director, Emet Ozar, who is acting as the project manager, along with educator Alisa Bouer, digital media producer Ori Salzberg and the staff of the Cohen Home, the senior residents and their teen visitors are embarking on a joint project: the creation of a video documenting the dialogue and encounter between the teens and residents. The project will feature segments of the interviews exploring the life experiences of the seniors. The also teens are taking photos of the residents and of objects that hold meaning for them. 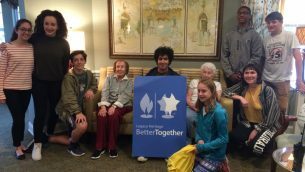 The Reconstructionist synagogue acquired a grant from the Better Together Program, designed to encourage meaningful interaction between the young and the old. The product is a story on film, along with an artistic photography exhibit, but the process of nine meetings during the school year is more important. 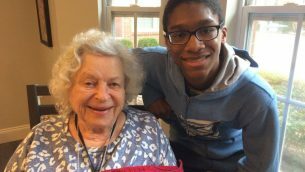 The seniors and teens have transcended age barriers to form bonds of friendship. This endeavor is a testament to the often-overlooked values of the older generation. As the teens and seniors spend time together and became more comfortable with each other, the questions, answers and stories flow. And, as Jordan and the other teens have learned, the two generations have much to learn from each other. Named Next Dor, playing off the Hebrew word for generation, the project highlights many values integral to Judaism: the importance of learning, the commandment to respect our elders, and the necessity of passing down traditions, stories and Jewish pride from generation to generation. The 10 young adults, who are past their b’nai mitzvah celebrations, have chosen to remain actively involved with their synagogue and Jewish life. Phyllis Fielding and Kyle Ben-Yoar get to know each other. The seniors involved with the project also are happy. Eileen and Frank Seidman, for example, have formed a special bond with one teen, Maddy Laing. “Maddy is very bright, warm and loving. It is a wonderful project, and the young adults brighten our days by being here and interacting with us,” Frank said. The Next Dor project will culminate in a gala event, including live music, dinner and a viewing of a condensed version of the film, at 4:30 p.m. Sunday, May 21, at the Cohen Home. Family members of home residents and of Bet Haverim teens will be part of the special celebration. Elaine Sachs and Sonny Cohen are surrounded by new young friends from Bet Haverim. Soon after, the Breman Jewish Heritage Museum will show the film and photographs, along with anecdotes about objects that hold importance to the participants. The Cohen Home residents will take a trip to the museum to see the display. 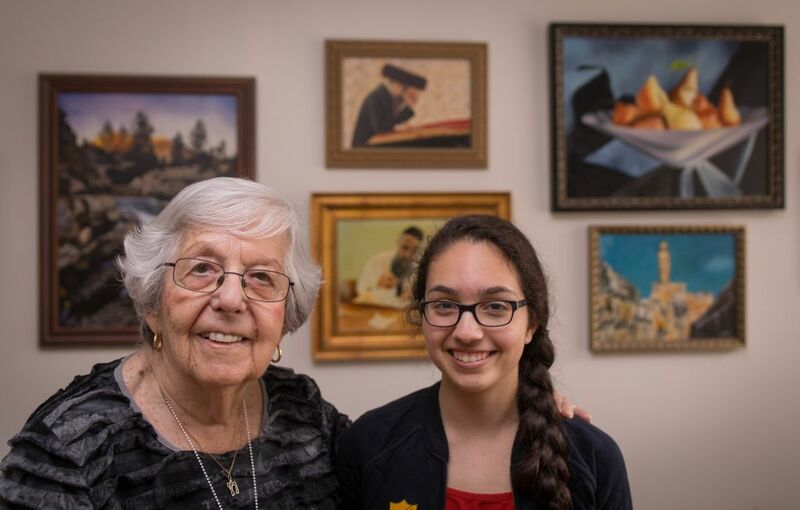 The Cohen Home and Congregation Bet Haverim are more than 20 miles apart, and the project’s participants are separated by more than two generations. But Next Dor has brought them together as if they truly were next door. 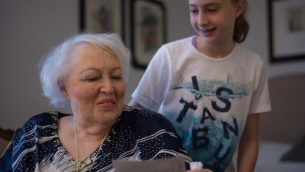 Suzanne Hurwitz, who holds a master of social work, is the life enrichment coordinator at the Cohen Home.